RubyKaigi and more recently Sapporo Ruby Kaigi have been providing realtime translation services. The way this has worked is that volunteers listen to the speakers presentation, and simultaneously translate it to an IRC channel that is broadcast next to the main screen, like the photo below. 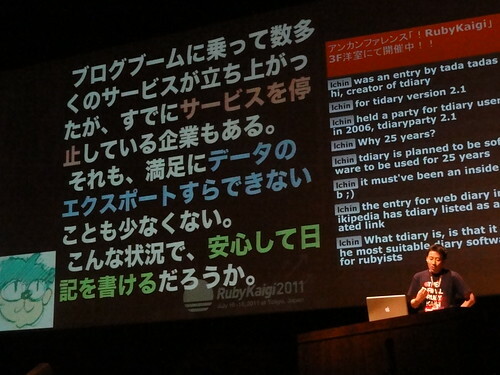 At RubyKaigi 2011, I tried to help, but my Japanese skills were not up to the task. When I was asked to help doing the same thing for Sapporo Ruby Kaigi, I initially refused, but after some persuasion, I agreed to do "backup" translation. However, when the conference actually started, I realized that if I didn't step up, many of the Japanese presentations would go untranslated. So I ended up doing a lot more translation then I anticipated. For less technical presentations, it wasn't as bad as I thought it would be, and as the event went on, some of the audience also helped out with translation (my thanks especially to @sora_h and @lchin). On Saturday morning, before Ryunosuke Sato's presentation, I had the opportunity to review his slides. Because the slides were only in Japanese, but were quite verbose, I decided to translate them. Then as he did the presentation, I pasted the translations into IRC, occasionally quickly adding something on the spot when he strayed from them. This process worked a lot better for me, and got me thinking about how if we did more preparation in advance, we could make it easier at the conference itself. After the schedule is published, a translator will choose a couple of presentations that match their interests and abilities. This process would require more effort per presentation (I estimate 2-4 hours per 30 minute presentation), but would then be less demanding on the day of the conference itself. Because of the extra time, translators could produce higher quality translations, and people who might not have the ability to do something in realtime could still help out. Because the job of translating would become easier, we could recruit more translators. This would allow us to divide up the work better, meaning that translators would have less responsibility during the conference. The idea would require the cooperation of the speakers, but the one speaker I did talk to about it was enthusiastic about it. This is just a skeleton of the process, and I think there is still room for more improvement, but I wanted to get my thoughts out while Sapporo Ruby Kaigi is still fresh in everyone's mind. I'm happy if you have any thoughts or suggestions on the idea.